Detailed, lightable* bridge interior, including the option of incorporating the edge-lit steps leading down to the helm/navigation station. Lightable thrusters in two different styles. Primary hull window drilling templates to correct the oval kit windows. (If the builder wishes, he/she can simply install the templates as they incorporate etched-in panel lines. Alternate engraved registries and numbers for other ships of this class. 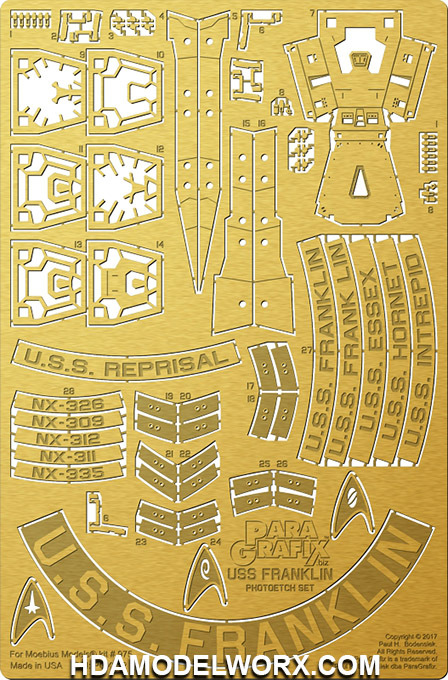 Display stand lettering for U.S.S. Franklin in the registry typeface. Three Star Fleet division insignia in the “Kelvin timeline” style.